For tourists with some spare or extra time in Beijing, it is possible to discover some places worth visiting outside the downtown; for hundreds of thousands of expats in the city, these places requiring one or two days are good choices for a weekend trip around Beijing. Hereunder are 8 feasible plans for your weekend breaks from Beijing. Day 1: Start off early on Saturday to take the Gubei Water Town Special Bus from Dongzhimen Outside and you can get to the town at noon. After lunch, have a stroll around the town and a boat trip. At dusk, enjoy the night view. Day 2: Get up early on Sunday to hike on the Simatai Great Wall and enjoy the hot spring in the town. Go back downtown after lunch. Situated under the foot of the Great Wall’s most original section, the Simatai Great Wall, the Gubei Water Town is a unique northern water town combining both simplicity and delicacy. You can not only appreciate some ancient buildings here but also have a night trip to enjoy the splendid night views of the town and the Simatai Great Wall. Hiking on the Great Wall to get the true flavor of the centuries-old structure is a must do in this weekend trip. Take bus line 916 at about 8 o'clock from Dongzhimen Bus Station to Huairou North Avenue and then transfer to Mutianyu Great Wall by bus line H07/ 23. Arrive at the Mutianyu Great Wall at 10:30 and take a cable car to ascend the Great Wall, and enjoy your 3 to 4 hours' hiking venture. The nearby Great Wall Museum is worth a visit. About 16:00, take a direct tourist bus back to the city. Visiting the Mutianyu Great Wall can be a perfect one-day weekend escape from Beijing. The Mutianyu Great Wall is famous for its elegance and it’s one of the must-see sections of the Great Wall. The most unique architecture style of Mutianyu is the dense watchtowers. You cannot miss the Zhengguan Terrace (No. 6 Watchtower), a two-storey terrace, which is comprised of three hollow watchtowers. In addition, taking a luge down from here is a very exciting fun-filled way to return. Day 1: Take a high speed train from Beijing South Station on Saturday morning. Upon arrival, visit the Ancient Cultural Street. After lunch, go to the largest Roman Catholic cathedral in the city, St. Joseph Cathedral, and take the sky wheels Tianjin Eye. 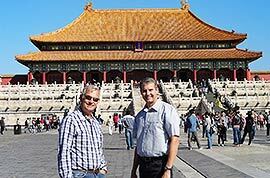 Day 2: visit the Porcelain House and Tianjin Radio and Television Tower, and then take a train back to Beijing. Tianjin is undoubtedly one of the best weekend getaways around Beijing and is a city with a long history and rich culture. The Ancient Cultural Street is lined with various famous old brands and handicraft shops. You can experience the unique folk art and taste the authentic local snacks there. Another highlight of your weekend trip is the Porcelain House, which is adorned by numerous china wares. The amazing design and decoration is well worth a visit. Day 1: Take the earliest high speed train at about 7:30 and arrive at Beidaihe at around 10:00. Upon arrival, enjoy a sunbathing in Tiger Stone Park and try some water amusements. At night, taste sea food in a local night market. Day 2: Get to the Dove Nest Park before 5 o'clock to enjoy the sunrise view. Then continue to enjoy your leisure time on the beach or have a coastal cycling. In the afternoon, take a bullet train back to Beijing. Beidaihe is one of the best places to escape the summer heat and is a popular weekend getaway. The beach, cozy sunlight and sea make for a relaxing short jaunt. In the day time, you can enjoy a sunbathing on quality beaches and have fun with a motorboat, beach volleyball, and surf boarding. What's more, watching a sunrise in Dove Nest Park is one of the best things to do in Beidaihe. If visiting in spring or autumn, you can even have an opportunity to watch more than 400 species of migrant birds. Take a train from Beijing Station to Chengde at 8 o’clock and you can get to the Mountain Resort at about 13:00.The first stop is the Resort Museum, namely the Palace Area. Then take a tourist car to sightsee in the Mountain Area. After that, enjoy a boat trip in the Lake Area or wander in the Plain Area. 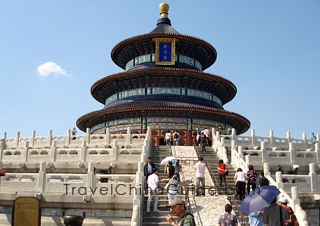 After visiting, take a late train back to Beijing or depart on the second morning. The Mountain Resort of Chengde is the largest existing classical royal garden in China and one of the most famous summer resorts. In summer, it’ s one of the best places to take weekend trips from Beijing. The resort is divided into four parts including Palace, Lake, Mountain and Plain Areas. The essential parts are the Palace Area housing many valuable antiques and the Lake Area featuring the perfect combination of the buildings and water. Meanwhile, some of the palaces were built in nanmu, a kind of precious Chinese wood and other valuable building materials to highlight the notable status of the royal family. Day 1: Start off in an early morning. Upon arrival, taste some local farm vegetables to refuel for the trip ahead. After lunch, stroll around the village and appreciate the ancient residential buildings. At dusk, watch the beautiful sunset. Day 2: Enjoy a sunrise and then take a short hiking to A Tread of Sky and Baiyu Valley. After this excursion, it's time to return. The Cuandixia Village features hundreds of ancient residential buildings from the Qing Dynasty (1644 - 1911) and it’s a good place to enjoy a weekend escape. The old houses with green bricks and grey tiles scattered on the hillside and the valley below form a beautiful picture. There is an observation platform where you can overlook the village. At sunrise and sunset, magnificent pictures can be taken there. At night, trying sleeping on the Chinese Heated Kang, a kind of brick bed featuring functions like cooking, heating and resting which will add to this unique experience. Day 1: Take a bus at 7:00 from Liuliqiao Bus Station and arrive at about 11:00. The first stop is Dajingmen Great Wall. Then go to Nuanquan Ancient Town to enjoy the Sparkling Molten Metal and stay overnight in the town. Day 2: Take a bus to Xuanhua County and visit the ancient towers like Gongji Tower, Zhenshuo Tower and Qingyuan Tower and appreciate the Jimingyi Post House in Huailai County. Zhangjiakou is one of the top places for a weekend break from Beijing. As the landmark of Zhangjiakou, the Dajingmen Great Wall has a history of more than 300 years and it’s a key pass along the Great Wall. Nuanquan Ancient Town has a history of more than several hundred years and boasts a kind of folk art, Sparkling Molten Metal. The hot molten metal, over 1,500 degrees Celsius no less, is poured onto the city wall and the molten iron will be sparkling and glistening to form a very spectacular picture! Day 1: Take a bus from Liuliqiao Bus Station to Fengning County and then transfer to the grassland. Upon arrival, take a horse riding to visit sights like Birch Forest and Huanghua Isle. At night, enjoy a bonfire party Day 2: Enjoy a sunrise on the grassland and join grassland entertainments like shooting arrows, grass skating, and other exciting military games. As one of the best places to have a weekend trip around Beijing, Fengning Bashang Grassland is known for the clear water, blue sky and a gorgeous stretch of grassland. In summer time, the temperature there is only about 20C, which is much cooler than in Beijing. You can immerse yourself in nature and appreciate the unspoiled beauty. What’s more, there are various entertaining activities including horse riding and motor cycling. The bonfire party and local dishes like Roast Whole Lamb add to the rustic appeal.